Zonnestraal aftercare colony for tuberculosis sufferers was founded with money collected by the diamond-workers union. The main building consists of three elongated blocks, with the medical department and the entrance in the north block, kitchen and storage space in the central block and sanitary facilities and the boilerhouse in the south block. Placed above these three is a cruciform restaurant giving onto a roof terrace on the south block. The latter also contains the entrance for patients coming from the pavilions to the restaurant. Each pavilion configures as two two-storey wings set at an angle of 45°, giving both wings an unhampered view of the surrounding woods and also plenty of sunlight. The two are connected by a communal lounge. The structure consists of concrete columns in a grid of 9 x 3 m. and supporting beams set longitudinally. Floor slabs cantilever 1.5 m., the beams invariably cantilever too. This counterbalance of moment helped to minimize the use of concrete. The facades have an infill of steel-framed glass; upstand walls and the walls of the annexes are hollow constructions of plastered wire mesh. Zonnestraal is an undisputed pinnacle of Dutch modern architecture. 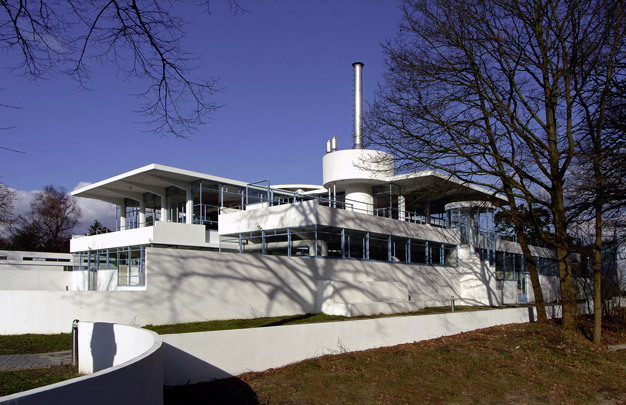 Its glass skin wrapped around the slender structure, the elongated white facades, cylindrical stairhouses and the chimney combine to create an image of white ships at their moorings - the perfect metaphor for modern architecture. For years Zonnestraal was more a ruin than the shining example it used to be. Then in 1995 the circular servants' house was restored thanks to the unselfish labour of Delft students. The main block and the timber worksheds were subsequently treated to an exemplary restoration.